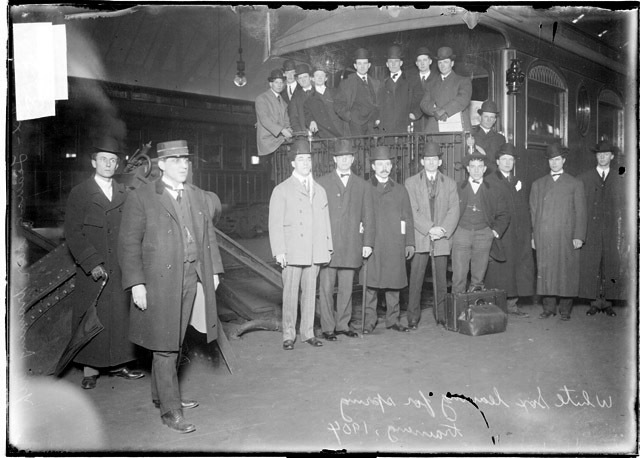 Title [Baseball team, Chicago White Sox, leaving for spring training, players gathered on railroad platform, train conductor stepping forward] [graphic]. Collection summary Group portrait of Chicago White Sox, American League baseball team, players gathered on a railroad platform in Chicago, Illinois. A train conductor standing nearby train conductor is stepping forward. Baseball teams Illinois Chicago 1900-1909.